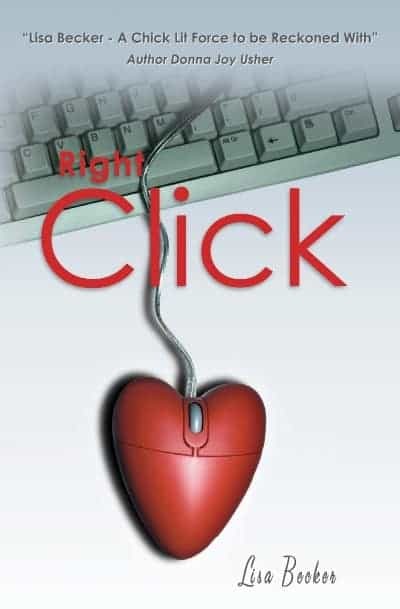 Right Click is the third and final installment of the Click Series and I was so excited to get back to Renee and her world. The style is unique, writing an entire book while exclusively using email exchanges between characters. You wouldn’t think it would work, but Becker figured out a way. Especially in this day and age with text messaging so easily at our disposal, it seems like no one really emails anymore, and yet there is always a legitimate reason that they are sending these messages as emails and not as a very long text message. I do think the whole series would be great in the normal format with interaction amongst the characters, but I think it works this way. To be honest, after reading the second book, I didn’t think there would be much else for Becker to do with this group of characters. I was excited to finally get to Renee and Ethan’s wedding, but aside from that I didn’t have many expectations. I was happily surprised with the plot twists that were thrown in that kept me engaged the entire time. I was especially happy with what happened with Shelley, Renee’s BFF who moved to Seattle at the very end of the second book. It was surprising, and yet very appropriate and true to her character. I love that. There is a very short epilogue at the end which I will say I was very happy to see. I hate ending a series and wondering what happened with the characters. It was short and sweet but gave the perfect amount of information to satisfy a curious reader. I think my favorite part about this series is it lets me satisfy that natural curiosity to eavesdrop without actually butting into people’s lives. You can’t tell me that you’ve never been tempted to peek into someone’s email or facebook or text messages when they aren’t in the room and happened to leave it open and available to you. I’ve never given into that temptation because I respect my friend’s privacy, but the thought has crossed my mind. Reading this series is like spying on all of these friends but without the guilt. Win, win. Connect on Facebook, Twitter, Pinterest and YouTube. Great review! I love the cover art! I’m glad there was an epilogue. I’m with you and don’t like getting to know characters only to have the story/series end at one “chapter”/poignant point but you know there are still many more things to come. I like the title of the Click Series. We are always saying, “Right Click,” “Left Click,” “Double Click.” They do make good titles and story ideas. I did have to smile at your no one using email comment now that we have texting. True but it doesn’t seem like that long ago we were talking about no one writing anymore do to emails. Times do change. My daughter is reading a book now that is written as a series of emails, albeit by a different author. I think I’d enjoy reading this series. Attractive cover, I missed this series, thanks for the review! It sounds like a fairly interesting book, I am not familiar with this series, I probably would not read this book. Thank you for this review. Thanks for the great review. So thrilled to hear you enjoyed the final chapter in the trilogy. I haven’t heard of this series. Sounds like something I’d read. Sounds like a good book series, I’ll have to look it up. Thanks for the review. You’ve made me want to go grab the whole series now! Thanks for sharing ! I am always looking for a good series to read. Will give this a try. I love books when there’s a series so that one book links up with the previous ones. Thanks for the review,interesting !